For more than a decade the USA Track and Field Junior (for athletes that don’t turn 20-years of age this calendar year) and Senior Championships have been held together at the same site every third full week in June, except in an Olympic Trials year, when the normal four-day USA Senior Championship turns into a 10-day, pressure-packed, exciting extravaganza with Olympic Team berths on the line. In those years, the Junior Championships are held on their own on the third full week of June at a different site and the week before the Olympic Trials. For some reason, USATF separated the Junior and Senior Championships this year. The Junior Championships were bumped up a week this year and are being held at the University of Indiana in Bloomington, In. The Senior Championships will be next week at Drake University in Des Moines, Iowa for the third time. Sadly, the change in schedule this year meant some of the best high school athletes in the county had to choose between the regularly scheduled National Scholastic Athletics Foundation’s New Balance National Championships in Greensboro, NC, and the USATF Junior Championships in Indiana. The USATF Junior Championships every June serve as a qualifier for a USATF Junior Team. Every year, the top-two finishers in each event at the Junior meet, who have a current passport, aren’t guaranteed, but nearly always are selected to qualify for a Team USA meet in July if they have met the meet qualifying standard. The USATF Coaching staff have some discretion in who makes the specifically sized roster, and can choose athletes whom they believe will have the best chances of success at the July competition, even if they finish third, etc. However, most of the time, if you finish in the top-two, have your passport, and qualifying mark for the July meet, you get selected. Athletes finishing outside the top-2 in the 100 and 400-meters can be selected for the 4×100 and 4×400 relay squads, but athletes qualifying in other events may also be selected to join the relay pools. Every two years, in odd years (2017, 2019, etc.) the Junior meet serves as a qualifier for the Pan-American Junior Games, a competition, between North, Central, and South American Countries athletes under the age of twenty. In even years, like 2018, the Junior meet serves as a qualifier for the World Under-20 Championships, which is held every two years, and is made up of competition from more than 130 countries whose athletics federations decide to spend money and send athletes and delegations. Last June, six Missouri athletes had great USATF Junior meets and made the 2017 USATF Pan-Am Junior Games Team that competed in Peru. 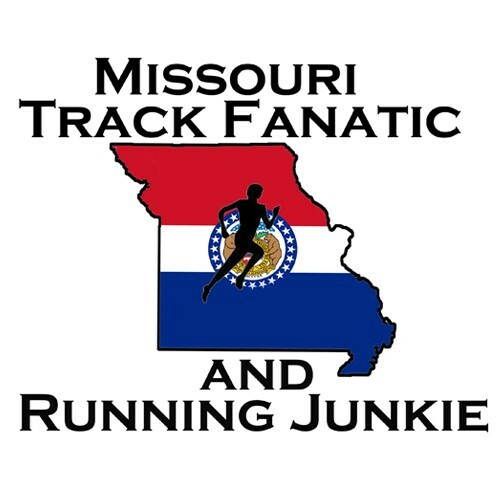 Missourians have had a lot of success at the junior meet in the past decade. A handful have made the World Under-20 Championships in recent history. Those include Chris Nilsen-Pole Vault, Deanna Price-Hammer Throw, Emily Sisson-3k and 5k, Courtney Frerichs-Steeplechase. This year, at least 26 Missourians qualified and are entered in to this weekend’s meet. A handful of Missouri competitors have good shots of top-8 All-American finishes, as well as top-2 finishes or close to it to earn berths to the World U20 meet in open events or relays. The IAAF World Under-20 Championships will be held July 10-15 in Tempere, Finland. Lee’s Summit High School senior KC Lightfoot not only broke Chris Nilsen’s state record in the pole vault, but his 18-5 clearance at districts moved him to second place on the U.S. High School All-Time List behind only Louisiana phenom Armand Duplantis, who represents his mother’s home country of Sweden in international competition. Lightfoot has an unbelievable streak of seven consecutive meets over 18-feet. His 18-0 mark at the Missouri State Track Meet broke Nilsen’s previous State Meet Record. The Baylor University signee won the Great Southwest Track and Field Classic in Albuquerque two weeks ago with a meet record of 18-3.75. Former Liberty High School star and University of Kansas freshman Kyle Rogers improved to 17-3.75 this year, which makes him the fifth seed in the pole vault. Three Missouri High Schoolers will compete in the 400-meters in Bloomington. Hazelwood West sophomore Justin Robinson and Park Hill South sophomore Chris Dupree put on a show in the Class 5 State meet. The duo battled to a 1-2 finish, clocking 46.93 and 47.19. The pair are seeded seventh and 11th. Cardinal Ritter junior Jameson Williams, the Class 3 State Champion, has a best of 47.23 from early May and is the 14-seed. Four-time 400-meter State Champion Domenik Peterson’s in-high school season state and state meet record of 46.81 survived for another year and is now 15-years old, but it may not last another year. The Missouri trio this weekend will look for top-4 finishes, and could put a scare into Quincy Hall’s all-season state and sophomore record of 46.71 from early August of 2014 at the AAU Junior Olympics. University of Missouri freshman Chris Conrad, an O’ Fallon, Il, native and O’ Fallon Township High School grad, is the 3-seed in the 800-meters. Conrad was one of the top high school 800-meter runners last year with a 1:49 clocking. The freshman scored points in the event at the SEC Outdoor Championships, where he set a PR of 1:48.68. Mizzou Coaches Brett Halter and Marc Burns appear to be putting some emphasis back in the two-lap event, as the Tiger have had lots of half-mile standouts over the last three decades. Conrad could be the first Tiger in recent history to qualify and or earn USATF Junior All-American honors in the event, while in the last 20-years it seemed like a yearly happening. St. Louis native, Rockwood Summit High School standout horizontal jumper and 300m hurdler Rayvon Allen, the Wichita State freshman, is the number two seed in the long jump with his PR of 25-3.5. Allen was one of the top high school triple jumpers last year, going over the 50-feet mark, just off the state record. Ritenour High School senior Diamond Riley developed into one of the best Missouri prep horizontal jumpers ever for Coach Reggie McNeal and staff. Riley just missed 19’ long jump mark with her PR of 18-19.25 runner-up finish at the Class 5 State meet last Month. Riley captured her second straight Class 5 triple jump title at state, then a week later, Riley set a Missouri all-season state record with a 41-11.5 hop, skip, and jump in the nearly 1-mile high elevation in Albuquerque, NM at the Great Southwest Track Classic, taking second overall. Riley’s mark makes ties her with the seventh-best entry in the meet. Lee’s Summit West throwing superstar Makayla Kelby won two more state titles in the shot put and discus to help the Lady Titans to a third straight Class 5 title last month. Her PR of 170-8 appears to be the second best mark in Missouri only behind former Marquette’s Amarechi Ukabam’s 176’ mark. Kelby enters the competition as the eighth seed and looks like the third best high schooler in the meet, while the college freshman in the field will try to keep her from All-American honors and a Team USA berth. Former Washington High School All-Stater Clayton Duchatschek, who just finished his first year at Lindenwood University, will compete in the steeplechase. Duchatschek was in last year’s Class 4 State meet 3200-meter race. The epic race saw all eight All-State finishers go under the 9:20 mark. Duchatschek is the fourth seed Sunday with a PR of 9:23.90. Duchatschek will hope for some cooler conditions, as he’ll need to get down to 9:10.00 to meet the U20 Championships qualifying mark. Shauniece O’ Neal will look to become the latest Southern Illinois University Saluki to earn All-American honors in the hammer throw. The Hazelwood Central former All-State shot putter and discus thrower has quickly taken to JC Lambert’s coaching and picked up the hammer throw technique. O’ Neal is the fourth seed with a 192-3 mark. O’ Neal will try to match former Troy High School All-Stater turned NCAA Champion and Olympian DeAnna Price. In 2012, Price finished second in the event at USATF Juniors and made her first U.S. Team, and competed at the U20 Champs in Barcelona, Spain. Price has made the last two senior Outdoor World Championships teams as well as the 2016 Rio Olympics. Last month, Price broke fellow St. Louis area native Gwen Berry’s American record in the event, before Berry reclaimed it last week. Trinity Catholic High School freshman and Ultimate Speed Academy Track Club’s Sydney Juszczyk is a standout sprinter, hurdler, and jumper. However, when your dad is a throws coach and threw the javelin in college, you get to learn to throw the spear around. Sydney has been a star in the javelin for a couple of years and set the AAU National Record for 14-year old’s last year. This year, Sydney tossed the number two high school mark in the country at the time early in the season in March, competing unattached in a meet at Washington University in St. Louis on the rubberized runway. She set a personal record of 161-8 at the Ladue meet in April on the grass at Parkway Central. At State, Juszczyk finished sixth in the triple jump in Class 3 and has a PR of 36-4, was second in the 100-meter hurdles and has PR of 14.84. Juszczyk ran on the runner-up 4×200 relay and won the javelin title to help the Titans to a runner-up team finish. Juszczyk only needed one toss to win the javelin title with a 142-03. She did take a second throw in round five, but had preliminary track races at the same time, so took just two tosses. Her father Peter is the throws coach at Trinity, after previously coaching at Hazelwood Central. Sydney has a bright future, and down the line may have some tough decisions to make; stay with the sprints, hurdles, jumps, and javelin, or focus all the talent on the heptathlon. Former Festus High School standout Brittney Borman faced the same issues, and she eventually left the heptathlon behind to focus on the discus and javelin. After two NCAA titles, two world championships and Olympics berth in the javelin, Borman retired last year after multiple knee surgeries. St. James High School junior Grant Conway set a PR of 14.17 in the 110-meter hurdles at the Class 3 District 5 meet. A week later disaster struck as Conway finished last at Sectionals in 17.82. Conway rebounded though and took third at the Class 3 State Meet in the 100 and 200-meter dashes. He took runner-up to fellow USATF Junior National qualifier Jameson Williams (400m), in the 300-hurdles, setting a PR of 38.05. Conway scored all 20 points at State for St. James, as they tied for 10th in the final team standings. With Conway’s speed and hurdling skills, a long with a 6-3 high jump PR, he might want to play around with a shot, discus, and pick up a pole vault pole. He’ll be a highly sought after hurdler in college, but multi-event coaches might try to talk him in to giving the indoor heptathlon and decathlon a try down the road. Conway is the 12th seed in the 110-hurdles, but a strong performance could put him on the radar for many more college coaches around the country. Jefferson (Festus) High School junior and Jefferson County Jets Track Club member Anna Heacock earned USATF Junior Nationals All-American honors with a top-8 finish in the heptathlon in the heat of Sacramento last year. This year, Heacock led Jefferson to a second straight Class 2 State team trophy and added two more state titles to her resume in both the hurdle races. She improved her heptathlon PR to a score of 4,400 points at the Great Southwest Track Classic in Albuquerque two weeks ago to place third. Heacock is the eighth seed. One-third of the decathlon entries are Missouri Men. Four of the 12 who will compete in the 10-event, two-day competition are from Missouri. Hillsboro High School senior, Jefferson County Jets Track Club member, and Purdue University signee Isaiah Martin looked like he was bound for the Pan-Am Junior Games team last year in Sacramento. However, after the final event of day one of the decathlon last year, Martin was disqualified after stepping on the line on curve in the 400-meter dash too many times. This year, Martin set a Missouri record with a nearly 200-foot javelin toss. Martin is an excellent hurdler, capturing the Class 4 300-meter hurdle title in May with a PR of 37.80 and was second in the 110-meter hurdles in a PR of 14.27. Martin won the Great Southwest Track Classic Decathlon with a PR of 6,946 points, despite just a 52-foot discus toss. Martin did set a nearly 3-inch PR in the high jump in Albuquerque at just under 6-3, as well as a 49.73 400-meter PR. Martin is already elite, but if he can get consistent with the disc (119’ PR), and improve a couple feet in the pole vault (10-11.75 PR) he’s got the chance to be exceptional. College coaches know that, and former Olympic Decathlete Chris Huffins won the recruiting battle for Martin and will have the chance to develop Martin even more at Purdue. Martin enters the meet as the number two seed. Centralia High School junior Peyton Davis made it a 1-2 finish for Team Missouri in the decathlon at the Great Southwest Meet. A week before that though, Davis had a great state meet for the Panthers. Davis won the Class 3 javelin with a 186-11 PR toss. Davis added a runner-up high jump finish with a 6-5 clearance, just off his PR of 6-6. Davis added a third-place finish in the long jump and has a event best of 23-1. Davis also took fourth in the 300-meter hurdles at state with a fourth-place PR of 39.55. Like Martin, Davis struggled in the discus in Albuquerque, measuring a best toss of just 36-1 (115-1 PR), making his place and point total of 6,877 even that much more impressive. That score makes Davis the fourth seed. Davis has also run cross country each of his first three years of high school and finished 86th at the Class 2 State meet as a freshman. His 1500-meter decathlon PR is 4:38. Two Park Hill High School Trojans round out the Missouri decathlete qualifiers. Grant Downes was an All-State hurdler and graduated last year before competing at Wichita State University this year. Downes was a USATF Junior Olympic Decathlon All-American last year, placing eighth in his age-group. This year, Downes just missed scoring at the American Athletic Conference meet, placing ninth. Downes score at the conference meet of 6,348 points was a PR and makes him the ninth seed. Park Hill junior Kolby Heinerikson placed sixth in the Class 5 javelin last month, and was 12th in the 110-meter hurdles. Heinerikson scored 6,055 points in taking seventh in the decathlon at the Great Southwest Track Meet, and his score makes him the 10th seed. Here is a look at #TeamMO athletes who will be competing. 100 12 11.72 Brittney Johnson Ultimate Speed Academy TC, Western Texas College Fr. 200 16 24.09 Jada Moore St. Louis Blues Track Club, Pattonville HS Jr.
400 07 46.93 Justin Robinson Gateway City United Athletics Club, Hazelwood West HS So. TJ 08 49-9/15.14m Aaron Jones Ruskin HS Sr. Kansas City, MO. Missouri S&T?